Let's learn the alphabet! Make it fun for your children to practice letters and sounds during mealtime with these fun and educational EarTwiggles ABC Chart Place Mats. 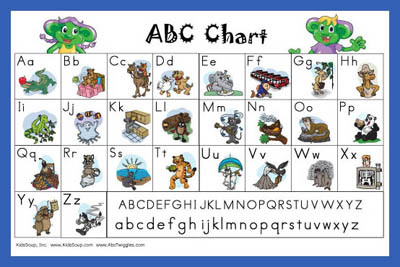 Print ABC Chart printables and cut along doted line. Tape pages together. Glue on top of two craft paper sheets. Laminate on both sides.